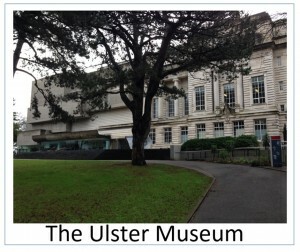 The extensively refurbished and modernised Ulster Museum reopened to the public in October 2009. It contained a number of contentious displays in its ‘Nature Zone’ exhibition area. 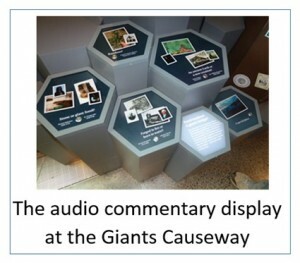 In accordance with Creation Outreach Ministries’ (COM) mission to ‘contend against the theory of evolution’, COM sought to have the museum’s displays amended to more accurately reflect the Biblical worldview. “Evolution is the natural process that makes sense of living things around us and, indeed, of ourselves”. “Evolution is a fact, based on changes seen in fossils and in living things today”. “There is a theory of evolution which combines our knowledge of biology, genetics and fossils to explain the processes that underline the facts of evolution”. In addition, many references to millions and billions of years featured across the museum’s ‘Nature Zone’. These statements stem from a naturalistic worldview that excludes special creation and this philosophical context is not explained to the reader. In March 2010, ‘Theos’, a Christian think tank, published the findings of its research project into the, “UK public opinion on evolution and the origins of living things”. One of the findings of the UK wide study concluded that, “Northern Ireland has the highest proportion of people [in the UK] who believe in Intelligent Design (16%) and Creationism (25%)”. [i] This means that a considerable proportion of Northern Ireland’s population reject the naturalistic, Darwinian worldview that has become prevalent in the West. In light of these findings COM felt that the views of this significant proportion should be represented in this public institution. Fair representation is also enshrined in Northern Ireland’s legislation. Section 75, paragraphs (1) and (2) of the Northern Ireland Act (1998), require that public authorities should promote equality of opportunity to people of differing religious beliefs and opinions and should promote good relations between them. We, the undersigned, whilst heartily commending the museum for its recent modernisation and upgrade, wish to express our concern regarding some displays which present a one-sided view regarding the origin of the world and its enormous biodiversity. We feel that it would show parity and balance to present displays highlighting the huge body of scientific evidence which supports the case for intelligent design by a supernatural creator. This is particularly relevant to the Ulster Museum, as Northern Ireland has the highest percentage of creationists in the UK and the museum is publicly funded. We respectfully ask the museum authorities to make tangible changes to relevant displays to present a balanced approach to the question of origins. Signatures were gathered via speaking engagements, outreach events, church newsletters and individuals encouraging participation. 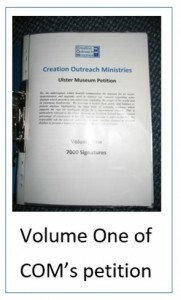 In total, 11,267 signatures were recorded from October 2010 to February 2012, representing a wide spectrum of opinions from people who agreed that the Ulster Museum should present a balanced approach to the question of origins. On 14th March 2012, a delegation from COM met with Mr Tim Cooke, Director and Chief Executive (NMNI) and Ulster Museum’s Director of Collections and Interpretation, Dr Jim McGreevy. A frank and cordial discussion followed in which COM’s issues with the Ulster Museum’s ‘Nature Zone’ were raised, and proposed methods or presenting a more balanced approach to the question of origins were put forward. The petition of 11,267 signature was then formally presented to NMNI on 6th April 2012. The Director and Chief Executive of NMNI, Mr Tim Cooke, responded in writing on behalf of the Ulster Museum Board, to COM regarding its’petition in July 2012. He advised that while they, (NMNI), “recognise the depth of conviction reflected by the petition”, they fully endorse the approach taken in the ‘Nature’ galleries of the museum. The Museum Board felt that their approach was, “based on the current scientific consensus, which itself has been reached through sustained and rigorous peer-review and which is consistent with the position adopted by the Museum’s counterparts in the UK and Ireland”. In July 2012, this was seized upon by online groups and a number of establishment figures, including Prof. Richard Dawkins and Prof. Brian Cox. Dawkins claimed, “The age of the Earth is a matter of scientific fact, not opinion and balance and fairness do not enter into matters of fact”. [iii]This statement follows Dawkins’ pattern of regurgitating the establishment’s naturalistic worldview, instead of engaging with widely held and accessible counterarguments put forward by Creationists. Cox made his opposition known by resorting to expletives on his Twitter profile. Insult and ridicule it seems, were far more effective than reasoned debate, as the National Trust altered the audio segment in October 2012. The Freedom of Information request was submitted to NMNI. NMNI advised COM that it was considering an exemption to the request under section 36 of the Freedom of Information Act (FOIA). This section allows exemptions, where fulfilling the request may inhibit the “free and frank provision of advice”, or the “free and frank exchange of views for the purposes of deliberation”. NMNI issued a refusal notice, advising that it held two additional documents, both of which it considered exempt under section 36 of the FOIA. [iv] On the same day, COM requested that NMNI conduct an internal review of their decision. COM submitted a complaint to the ICO, asking that NMNI’s decision to refuse the FOI be investigated. The ICO wrote to NMNI requesting the withheld documents and a full explanation of the reasons for the refusal of the FOI. The ICO advised that an informal settlement with NMNI could not be reached and that a decision notice was being drafted to set out the commissioner’s findings. This could be used to force NMNI to release the withheld documents if the ICO ruled in COM’s favour. The ICO advised that our complaint had been upheld and that a decision notice had been issued to NMNI to demand that the withheld FOI documents were released. The ICO reported in its findings that the primary reason for NMNIs refusal of the FOI request was to protect the identity of the author of one of the documents, who had been commissioned by NMNI to produce it. NMNI believed that such consultancy could be inhibited if the identity of those involved may later be revealed following FOI requests. The commissioner overruled this argument, stating that “…NMNI’s argument is somewhat weakened by the fact that it is an assumption as to the motives of authors or reports, rather than a result of consulting with the author of the peer review in this particular case”. The commissioner also examined whether maintaining the exemptions used to prevent release of the documents were in the public interest, concluding, “…the Commissioner finds that the public interest in maintaining the exemptions does not outweigh the public interest in disclosing the withheld information”. NMNI releases the withheld documents to COM. The documents withheld from the FOI request were a report on, ‘Ulster Museum Nature Galleries’, authored by local Queen’s University Academic Professor David Livingstone and a ‘Peer Review of Interpretation’, that discusses the report authored by Professor Livingstone. Professor Livingstone’s report, commissioned by NMNI, was intended to provide feedback to NMNI regarding the content of the displays and exhibits within the Ulster Museum’s Nature Galleries and to provide general commentary on the experience of a museum visitor. The report begins with a lengthy commendation of the museum’s layout, visual aesthetics and display quality. The author devotes the majority of the report to feedback regarding the museum’s ‘Fossils and Evolution’ gallery and prefaces his commentary stating, “The stance I have adopted endeavours to be neutral about the truth or falsity of evolutionary theory and has sought to read the panel documentation with as critical an eye as can be justified from various points of view”. Despite trying to open with an air of objectivity a mere two paragraphs later Professor Livingstone drops his neutrality and reveals his own point of view stating, “The claim that ‘Evolution is a fact’ is entirely warranted”. Professor Livingstone advised NMNI that they might want to “…preface its factual claims by brief statements along the lines of ‘Biologists have shown that…’, ‘According to Charles Darwin…’, ‘Modern geneticists find no evidence for…‘”. Importantly, the author notes, “I suggest this simply as a means of indicating to visitors that what they see and read is not being promulgated by the Museum alone...”. This idea, nor referencing of any sort was subsequently taken up by the museum. Professor Livingstone also made a criticism of a display panel entitled, “Evolution – adaptation or design”, which claims that evolution operates without any design or purpose. Livingstone stated, “...that it looks like a philosophical claim rather than an empirical one.” This comment strikes to the heart of the matter, as it identifies the naturalist philosophy underpinning the display content. Naturalism presumes that all phenomena have a natural explanation; the possibility of special creation is excluded from the outset. Interestingly Professor Livingstone warns NMNI that the ‘Nature Zone’ display, “Will not find favour with those members of the public who are antagonistic to evolutionary science.” And that “In Northern Ireland, Christian creationism is likely to be the most widespread alternative view”. With Young Earth Creationism, “likely to reject just about everything in the gallery as it stands”. This means that the Ulster Museum had ample opportunity to address this issue long before the petition was even submitted. Livingstone goes on to comment that the likely objections to the Nature Galleries by groups who do not accept the naturalistic worldview also include: Old Earth Creationists, Intelligent Design advocates and Theistic Evolutionists. The author states, “It is simply impossible to satisfy the demands of each and all of these positions in a straightforward way”. COM would argue that a simple display advising that a significant proportion of Northern Ireland’s population do not adhere to the naturalistic, evolutionary worldview and a brief summary of the alternatives would suffice. On balance, the author highly praises the content of the ‘Nature Gallery’ displays, but makes a few brief suggestions and criticisms. The author offers a possible solution to the dispute, advising the Museum to, “consider developing an exhibition and/or lecture programme, talks and the like, which trace the debates over Darwinism and origins that took place in the North of Ireland during the final decades of the nineteenth century”. To date, no such action has been taken by NMNI. “Publication of a statement to be made available in the Museum itself and/or on the website, explaining that the Museum’s position is one based on scientific consensus which is generally, but not universally accepted”. “Amendment of text on gallery panels, in line with the minor changes suggested by [Author's Name], to indicate to visitors that the Museum is reflecting scientific consensus”. To date, these actions have not been taken.